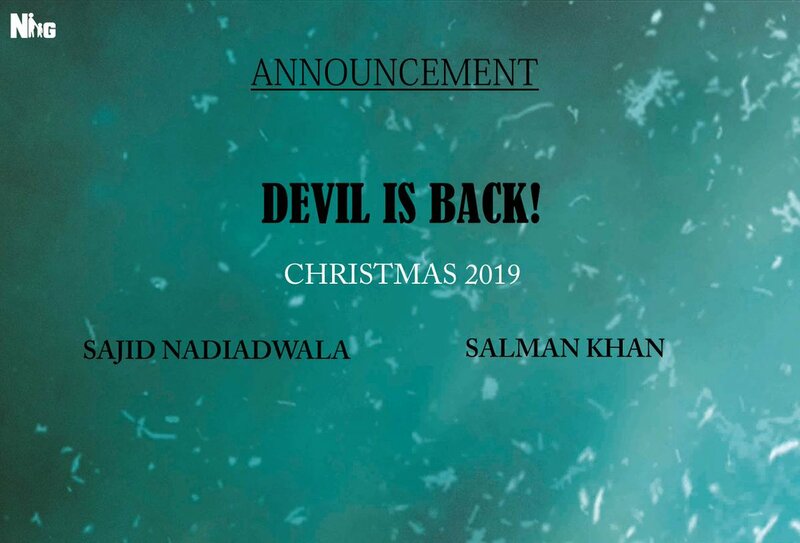 Kick 2 on Christmas 2019 - The Devil is Back! Salman Khan's Kick may not be the highest grosser of that time, but it was still one of the biggest blockbusters of the industry. With collection of approximately 225 cr INR net, the movie had beaten the second highest grosser of that time, Chennai Express, to become the new second highest Bollywood grosser. Kick was not only a big blockbuster but it was also termed as one of the most entertaining action thrillers of Bollywood. The irresistible charm of Devil and the larger than life personality of Salman Khan made this movie a masses favorite. It was interesting to note that Kick was Sajid Nadiadwala's first work as a director, and now he wants to return with Kick 2 - his second directorial venture. This feels like Sajid is trying to create his own movie series and wouldn't direct anything else. Anyways the confirmation came a couple of days ago that Kick 2 is scheduled to release on Christmas 2019, which makes it an even bigger movie. After the success of Tiger Zinda Hai, which is now the second highest Bollywood grosser of all time beating Aamir Khan's PK, it seems like stopping Salman Khan is not possible in this decade. Also it is certain that Salman is not going to repeat the mistake he made with Tubelight. His next is going to be Race 3 and we can see it in the big screen on Eid 2018. Whereas Eid 2019 and Christmas 2019 is already booked for two Salman starrers, Bharat and Kick 2 respectively. Now this means there is going to be a battle for the Diwali release between Shah Rukh Khan's Salute and Ajay Devgn's next period drama. We can also expect a clash between Kick 2 and Salute if Zero can do wonder this christmas. As of course everybody wants to see the battle that was missed during Sultan and Raees clash (which didn't happen as Raees postponed). The way Salman Khan is dominating the box office this decade, Kick 2 seems to be another mega hit. But can it do the same if it clashes with Srk's Rakesh Sharma biopic? Only time will tell.